These Keto Chewy Chocolate Chip Cookies are gluten free and dairy free which is perfect for a low carb or Paleo dieter. They are easy to make and the Vital Proteins Gelatin gives them have a little extra bite that makes them unforgettable. I baked these as a dessert for a family barbecue and my family who eats gluten free and mostly keto, all went crazy over the taste of these chewy cookies. The yummy texture comes from using a little bit of grass fed gelatin. These keto chewy chocolate chip cookies have many health benefits because they are low carb and sugar free with lots of healthy fats and antioxidants from dark chocolate. One thing many people may not realize is that gelatin from pastured, grass fed animals is a missing ingredient in the Western Diet because so many people eat a vegetarian meals or only eat boneless skinless meat such as chicken breast. As a nutrition consultant it is a pet peeve of mine to see so many Americans missing the crucial components found in gelatin which are building blocks for a strong immune system, as well as gut and skin health. The best way to get it is to make pastured chicken or beef broth but many people don’t have time to do this laborious process. 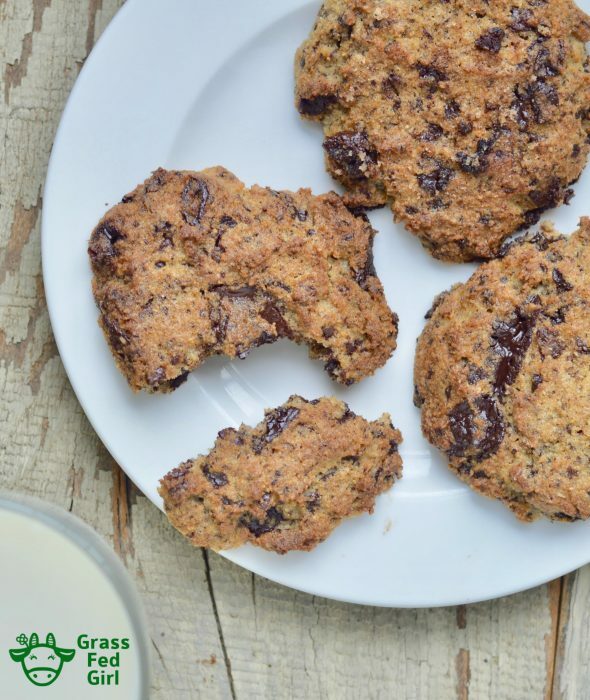 A shortcut is to keep Vital Proteins Gelatin and Collagen on hand for using in recipes such as these Keto Chewy Chocolate Chip Cookies, I like to mix this into smoothies or coffee for a boost in energy and nutrition that you can see and feel.